Generally Ships Same or Next Business Day. 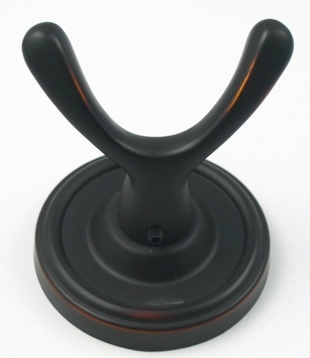 Midtowne robe hooks are easy to mount and are available 5 finishes to compliment your other home hardware. Be sure to check out the entire line of Midtowne bathroom accessories to complete the look in your bathroom. 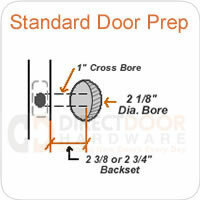 Our Midtowne Collection of bathroom accessories is a great compliment to our door hardware products. Coordinate your home decor with decorative hardware in Weathered Pewter, Satin Nickel, Oil Rubbed Bronze, Chrome and Black finishes. Be sure to checkout our other bathroom accessory lines. All Rusticware Bathroom accessories are zinc die cast with a plated finish except for the ring on the towel ring and the arm on the euro tissue holder - these items are made of brass. All bath accessories come with mounting hardware. Hardware is interchangable between towel bars, robe hooks, towel rings paper holders etc. Rusticware Midtowne robe hooks include 1 decorative mounting bases, the robe hook itself and mounting screws, brackets and drywall anchors. Bathroom accessories are fairly easy to install and requires minimal tools.